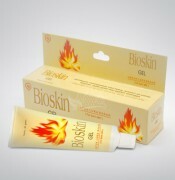 BioSkin Gel 60 grams - Helps relieve burns, scalded, sunstroke, itching and insect bites. • Tea tree oil Have anti-inflammatory and pain relief. • Aloe vera (Aloe vera) Relieves burns and accelerate the healing of skin. • Centellae herb extract (Centella asiatica) Helps in cell regeneration. Helps relieve burns, scalded, sunstroke, itching and insect bites. 4-5 times a day, smeared on the wound. Wound not get wet during the treatment.